If you are travelling by car make sure you have 25 Singaporean Dollars to buy a Cash Card from the touts. Or have Ringgits otherwise you will be ripped off - officially. You would think we would have learnt our lesson about using the car lane. But no we had not. I actually looked to make sure there would be enough head room and it all looked fine. What I didn't notice is that the cars go into a very high area and are then funnelled through short tunnels about 2.1 meters high where the officials are in booths. Pieter mounted the paving and reversed while I went and found help. Traffic was stopped so we could go the wrong way and into the bus lane. Once again the officials had no experience with carnets and I went off with an official to find a knowledgeable person. Once this was done it was a matter of placing the cash card against a card reader and off we went into the maze of Jahore streets. We eventually came across Danga Mall but there were no banks. We did not have to drive far for me to see one across the road. Unfortunately they did not have a Foreign Exchange Department but did direct me to the bus terminal where I found one to change some British Pounds. Unfortunately our current account is empty and we must wait until the end of the month for more money to come in, otherwise we could have used an ATM. Just as well we have some backup. We went back to Danga Mall for the night. It is very new and still half empty but the food hall provided a nice meal. We headed for the coast as soon as we could, much better than travelling on expressways if you are not in a hurry. Although the road was flat and it rained occasionally, it was interesting to see the difference with Singapore. There are many wooden houses built on stilts off the ground although the newer ones are of brick and on the ground. The gardens consist of flower pots and either lawn, mown weeds or gravel. Each family has a house. There were only a few apartment blocks in Jahore Bahru. There were Mosques, Temples and Churches as well as cemeteries for each of the religions. The best was a Chinese cemetery with semi circular shaped graves beautifully tiled. The Muslim cemeteries tended to have vases and were generally better kept. I was tired and so we stopped by the sea about mid-day near a small food hall. One of the Chinese stall owners bought us lunch. What a lovely introduction to Malaysia. We passed many Oil Palm Plantations. Malaysia has a reputation for burning down natural forest to grow Oil Palms, a practice which is not good for the planet but brings jobs and money to the Malaysians. 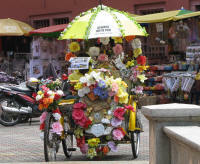 Melaka is a small city and we expected to find some sort of Boulevard by the sea. No such luck. After driving around for a while we came across a river tour ferry terminal. Here we were able to buy a map and asked where we could stop by the sea. We followed the directions and ended up way out of town. In the end we spent the night in the parking lot of Tesco. We decided to take a bus into town as we already knew that the centre contained narrow streets and little parking. The main bus stop was just across the road. I was fascinated by one well dressed made up Muslim woman on the bus. When she got on there were no more seats. Eventually she 'demanded' that one of 3 young men get up and give her a seat. Instead an older man got up and she obviously and loudly said he should not do this, one of the youngsters should. Since we had to wait about 20 minutes before the bus left more passengers boarded. One was a young woman. The older woman pushed at the young man beside her to provide space for the younger woman. It ended up with 5 people on 4 seats with the 3 young men squashed on 2 and a bit seats, but they would not get up! It was truly a fascinating drama. Obviously Muslim women have quite some say in social life here. The intention was to eat something and see a cultural show. Both were near the Stadhuys and disappointing. Another nearby music and culture show looked just as uninteresting. Pieter had deep fried prawns, fried in batter with their shells still on! While we were waiting for the bus back I asked two young men when the bus would come and if it was too late how much was reasonable for a taxi. They did not know but gave us a lift back to the van. On the way they showed us a place near the sea next to the Holiday Inn where parking was free (N 02˚ 11.285 E 12˚ 14.819) and the sights and 2 malls within walking distance. One day the spot will be developed but for now it is ideal. I went sightseeing on my own as usual. The first was the Town Square. Christ Church built by the Dutch in 1753 has services in English, Mandarin, Malaysian and Tamil. The Stadhuys Museum has an exhaustive history of Melaka starting with the Indian Prince Parameswara who had been exiled from Singapore. 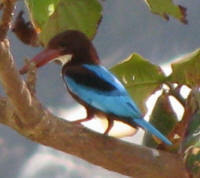 He was sitting under a Melaka tree when his dog attacked a Mouse Deer (about the same size as the dog). The Mouse Deer kicked the dog in the nose and into the river. The Prince decided to set up his sultanate on the river and called it Melaka. Other places on the coast have much wider and deeper rivers. Several generations with the usual political intrigues followed. Arab traders arrived and started the conversion of Malays, the Portuguese arrived in 1511, the Dutch in 1641 and finally in 1795 the Dutch gave Melaka to the British in exchange for Bencoolen a town in Indonesia. Each group lasted through several different rulers and each ruler / governor is mentioned. The most interesting aspect for me was the models of how the settlement grew and the clothing of the different groups. There are Malays, Baba Nyonya (Malay Chinese mix), Chitty (Malay Indian mix) and Portuguese. Each still tend to live in their own areas. The next museum I visited was the People's Museum. Traditional games and the history of kites is covered. The most interesting section was the Beauty section showing how people mutilated themselves for beauty. Some of the changes are mild such as my pierced ears but some are extensive. Even today there are people who have covered their bodies with tattoos. 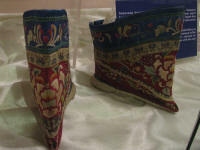 Other changes through the ages have been to the shape of the head, inserting plates into the lips, heavy ear-rings, foot binding in China and lengthening the neck in Africa. X-rays have shown that the rings these women put on their necks actually push the shoulder blades down so the neck consists of additional spinal bones and the chest area is constricted. The next day I set off again but this time I met a British woman of Chinese descent, Victoria, and we teamed up for the day. It is always nice to be with a companion. We headed for China Town to the Baba Nyonya museum. 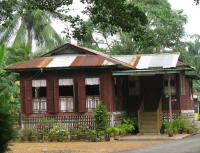 It is actually a traditional Baba Nyonya private home that has been turned into a museum showing the house as it was in 19th and 20th century. 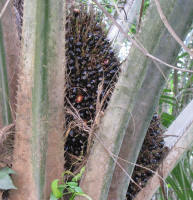 The family now live on their Oil Palm Plantation. Wedding clothes and the dowry chest were included. The dowry chest is a set of round containers placed on top of each other. Traditionally the containers would be filled with pots, pans, bed linen and other household goods. Now they are smaller and filled with diamonds and other jewellery! The shower and bath had cold water only. When I commented on this Victoria, who is staying with relations in KL said that most homes still had only cold water showers as the weather was so hot and humid. We visited the Cheng Hoon Teng (Temple). It was built in 1673 by Kapitan Tay Kie Ki. It is Malaysia's oldest temple with all the building materials imported from China. Not a single nail was used in the wooden construction of the main shrine hall. It has been upgraded over the years by various patrons. 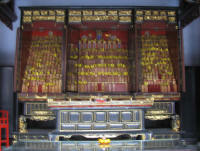 The temple itself covers the Buddhist, Confusion and Tao religions. It houses a statue of Kwan Yin (Goddess of Mercy) and has alters dedicated to ancestors. The name of the ancestor is written on a wooden stick perhaps with a photo and added to the others on the alter. The temple was also used as a meeting place for the leaders of the Chinese Clans (Kapitans) to discuss the problems of the day and to formulate rules and regulations for the protection and welfare of the Chinese in Melaka. That is until 1824 when the British took over the task. After wandering around China Town a little longer we headed across the river and up the hill to the ruins of St Paul's Church Built in 1521 By a Portuguese sea Captain Duarto Coelho and called Nosa Senhora (Our Lady of the Hill). The Dutch renamed it to St Paul's. The British used the church to store gun powder! Two famous people have been interred at the church. The first was St Francis Xavier who was buried here (in 1552?) for 9 months before his body was taken to Goa. The second was the wife of Jan van Riebeck, the founder of the Cape Refreshment Station for the Dutch East India Company. The original grave stone was taken to Cape Town in 1915. At the bottom of the hill is the sole surviving relic of the Portuguese Fort "A Formosa" (The favourite). The fort surrounded the hill and the gate Porta de Santiago is all that is left. When the Portuguese took Melaka they ousted the Muslim Traders from the city, pulled down the principal mosque and replaced it with the fort. 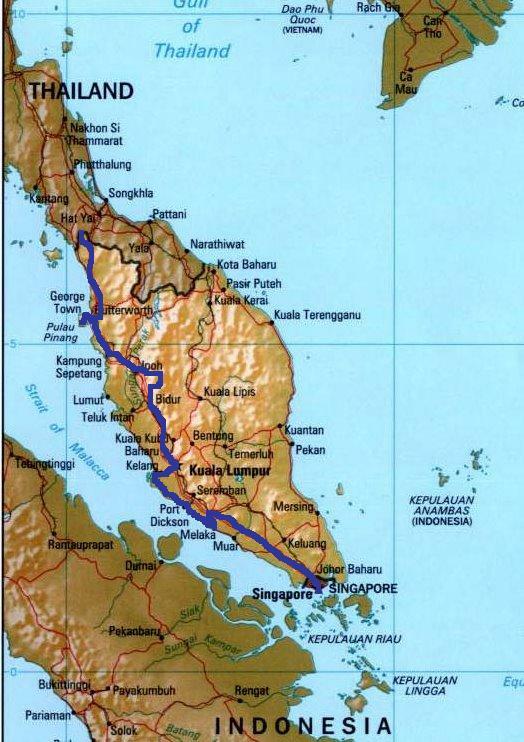 We took it slowly up the coast, once again past Oil Palm Plantations, rivers with boats, Mosques, Temples and cemeteries. When it was about time to stop we came across a beach with ablution facilities, toilets and cold showers, and decided to stay a day. It was heaven to have a shower, all that lovely water splashing over a hot body. There had been very few places to stop on the way. 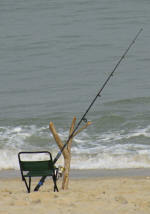 The coast is either developed where resorts own the beaches or it is plantation or jungle. This beach was very relaxing. There were the usual attractions, swimming, speed boats, banana boats and eating. The crowds started coming so we filled up with water and left. One sight see-er must have been Bangladeshi, certainly Indian ancestry. He climbed inside the van and when we indicated he should go out, he went around and climbed up and almost through the open back window. He thought it was funny! Wonder what he would think if we did that in his home. Kuala Lumpur covers a relatively large area. Large enough to have Ring Roads and expressways. We were looking for a park or Tesco. Eventually we found a nice paid parking area but the fees were too high. Another driver with his wife explained how to get to the 2nd ring road and Tesco. Once again there was an equal conversation between the two on the exact route. This country has such a nice version of Islam. We parked at Tesco. Not inside the parking area though as they asked us to move out in the early hours of the first night. The design of each tower's floor plate is based on Islamic geometric forms of two interlocking squares creating a shape of 8 pointed stars. These forms describe the principal of unity within unity, harmony, stability and rationality. 8 semicircles were superimposed in the inner angles of the interlocked squares to create more useable floor space. To maintain the vertical axis and tapering of the design each tower is set back 5 times in it's ascent. At the uppermost floors the walls are gently sloped inwards to taper and contribute visually to the height of the towers. The 8 pointed star is also an ideogram of fourness in many creations e.g. 4 cardinal directions (N, S, E, W), 4 elements (fire, water, earth and air), 4 physical conditions (hot, cold, dry, moist; 8 properties - radiance, crystallisation, solidity, fluidity, liquid solutions, contraction, expansion, gaseous). I also went to China Town for some lunch, then on to Masjid Negara the National Mosque. Unfortunately non-Muslims are not allowed inside. They also have a poster asking people to boycot American goods and showing a photo of a dead child in rubble. The photo has so obviously been created by computer software based on other photos its a wonder it is used. The scene could just as easily be made up from photos taken in Israel, Afghanistan or somewhere else. Merdeka Square, the old colonial centre, and the National History Museum was the next stop. Unfortunately the Natural History Museum was closed last November. Merdeka Square was pleasant. It is where independence was announced on 31 August 1957. But by now it was definitely time to go home. By this time I was feeling confident about which trains to catch - that which comes before a fall! I caught the train going in the right direction but did not realise there were two branches and I was on the wrong one. By the time I realised this and returned to start again I had spent an hour on trains and stations. This time I made sure I caught the right train! We will stay in KL until we receive some money. The area is pleasant enough and we have enough money to buy food. We could go on as we have a tank of diesel but would like to go into a hotel for a day or two and that takes money. The money arrived and we did a big shop, restocking the larder. Then off to the Batu Caves just north of KL. The main cave has been a leading Hindu Shrine since the 1890s. The main god is Muruga who gives prosperity. At 140 ft high (about 43 meters) it is the tallest statue in the world. 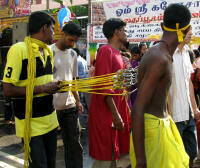 It is the sight of the annual Thaipusam festival where men and women cleanse themselves by shaving their head to inserting many hooks into their backs and piercing various parts of their skin. The Temple Cave at the top of the stairs has very little on show, presumably because of the coming festival. There were, naturally, the usual monkeys. We parked in a shopping area outside a closed shop figuring no-one would object. Not so, around 6:00pm we were asked to move as a man needed to set up his business on three adjacent parking spots. It is a small food stall with tables and he always stands on those particular spots. 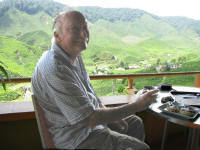 The road goes through hills covered in a mixture of natural vegetation, oil palm plantations and tea plantations. It gets cooler the higher you go. What a lovely change from the hot humidity of the low lands. It is also quiet a wonderful change from the constant singing and advertisements at Tesco's and the heavy traffic last night. It was cold instead and the 2 thin blankets were not enough for me. The second night I used one of our blankets and had a marvellous warm sleep. I wanted to see the Chinese New Year at Penang. The 25th is Lunar New Year's Eve and I was expecting lots of celebrations. Apparently this will not be happening though as it is a family affair and Monday all Chinese businesses are closed. They were actually closed for a week. The bridge to the island is about 12 kilometres long. It is being widened to 3 lanes both ways for the whole distance (currently there are 3 lanes only part of the way). If the traffic is usually as we found it this is vitally necessary. We did find a lovely spot by the beach to stay near Teluk Bahang and watched the local visitors. There were the usual activities available like the banana boat and being towed by boat on a parachute. 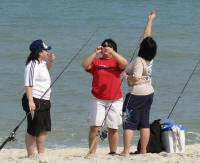 Most Malaysians swim fully clothed as is usual with Muslims. When they come out of the water it looks like a wet T-shirt competition - all is revealed by the clinging wet clothes. There are exceptions though, some men have speedos, some woman (not Malay) have swimming costumes. The most vivid contrast was a woman in a bikini sitting about 3 meters away from a black clad, face covered Muslim woman. I really pity the Muslim woman, she must have been exceptionally hot. A guy named Al interviewed us but it was for his own use even though he is in the media business. His wife Zaza was the camerawoman. Our car was also used as a backdrop for pre wedding photos. It is a Chinese tradition to take photos before the wedding, sometimes in the wedding gown, sometimes not. George Town was the area of the island first settled. When the British came in 1786 led by Captain Francis Light, they built on swampy ground which had to be cleared and filled first. There is still some land reclamation in progress as the hills go up quite steeply fairly close to the shore and the water is not that deep. At least the British East India Company paid the Sultan of Kedah for the land. The flag of the BEIC has the same red and white stripes as the Malaysian and American flags. The difference being the contents of the top left hand corner. Malaysia has the star and moon of Islam. NB. Light's son founded Adelaide in Australia. I walked around George Town looking at the historic buildings. The town became a UNESCO World Heritage Sight on 8 July 2008. Personally I found the buildings rather staid and not at all attractive. The best part about Fort Cornwallis was the music being played. It dated from the early 1800s. The oldest buildings at the fort are the church and a gun powder store. Both about 200 years old. While I was still on the bus I saw Adam on the street and quickly hopped off. We had lunch together and caught up on the past 8 months. I originally met Adam in Kashgar in western China. We went around the city together with John and travelled to Turpan together. Malaysia is his first trip outside China and he said he was enjoying it thoroughly and it was much easier than he had expected. With 10 days though he cannot see very much. Maybe I'll meet him some place else next year. The name Penang comes from the local name for the Betel Nut (Pinang). The betel nut tree looks like a coconut tree and is endemic to the island. I walked up Pitt Street where there is St George's Church (Christian), Quan Yin Temple (Taoist), Mahamariammam Temple (oldest Hindu temple on the island) and Kapitan Keling Mosque (Muslim). There are many Taoist, Confucian and Buddhist temples, christian churches and mosques in the old George Town area. Another one I visited was the Han Jiang Ancestral Temple with many pieces of wood on which the names of the ancestors are written. The view from the top of Penang Hill is glorious after dark when the lights of the city turn on. Pieter and I had been to Tescos and he dropped me off nearby. I met some Iraqi tourists, living in Dubai NOT Iraq, heading the same way. They told me it would be impossible to get tickets for the Penang Hill Railway because it was holiday season. They had obtained tickets for 6:00 pm at mid-day and it was now after 3:00pm. A local overheard the conversation and suggested we rather see Kek Lok Si Temple, the largest Buddhist Temple in Malaysia. Construction started in 1890 and took 20 years. It is well maintained and has a high pagoda which is being restored. The local said the pagoda had been lowered because it was higher than the main mosque on the island. True or not it does look a bit truncated. Naturally you must first go through souvenir and food stalls before reaching the main temple section. There are several alters with statues of Buddha and Bodhisattvars as is usual in such places. In one temple devotees were throwing coins into a dish at the foot of a statue to bring luck. About 80% managed, the other coins merely fell into the water. I guess the wish will not be granted to those. Eventually I decided to walk the short distance to Penang Hill and try my luck with the railway. They were selling tickets for 8:30pm. Far too late for me to get back to the van on the last bus. I declined, then was asked if I was alone. Yes, I answered. OK here is the ticket go on the next train! Being on your own can certainly have benefits! It was lovely and cool up at the top and very nice to sit there and have some dinner. Penang Hill was developed as a tourist destination in 1897. The first effort at building the train was unsuccessful but after WWl the Swiss were brought in and the railway was completed in 1923. There were originally 4 wooden coaches with first and second class seats. These have since been replaced by new Swiss trains which have only one class. The railway is used by people who live on the hill as a means of transport. There are several stations available. They have to inform the driver which station they need when they get on. I did not see the Hindu Temple which has the tallest Buddhist statue in Malaysia (or South East Asia?) or the Mosque but I did watch the lights come on. By then it was really time to get moving. The queue to go down was very long. I had to wait for the 3rd train, then again for the bus at the bottom to get into town, then again for the bus to Teluk Bahang. I am sure I caught the last bus as I only arrived at the van at 11:30pm! While waiting for the bus a taxi driver was trawling the people waiting to see if they would rather take a taxi than wait. I decided on a cut off time to do just that but the bus came first. 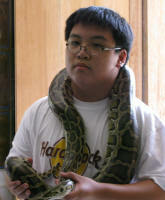 Next visit was to the Snake Temple (Hock Hin Keong Temple) as there was a festival on. 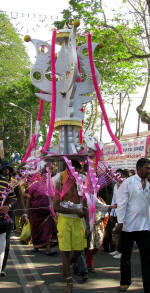 In fact it was the birthday of the god and consisted of devotees coming throughout the day to pray. Nothing organised, all private. 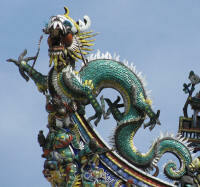 The temple was built in 1850 in memory of Chor Soo Kong, a Buddhist monk, who gave shelter to the snakes of the forest. They moved in once the temple was completed but have been de-venomed for safety. Most are kept in a 'zoo', only a few are in the temple itself. There are two old wells at the temple. Legend has it that when the temple was completed the Door of Heaven opened and a fierce dragon came down, danced around and finally came to rest with its tail to the west, head towards the east and its 2 eyes observing the north-east - a good Feng Shui position. Where the eyes were are two wells with clear sweet water. To drink from the wells will give good health, good fortune and a long life, I'll tell you if it worked one day. Then it was time for the New Year Celebrations for the year of the Ox. The Young Chinese had organised an "Open Day" showcasing the 5 Chinese provinces where the Malaysian Chinese originally came from. It was very interesting but of course what I wanted to see was a Lion Dance. 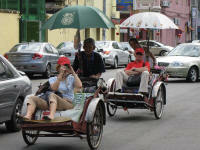 The 'In Penang' tourist publication said activities started at 9:00am and ended at 5:00pm. I did not believe the 9:00am but thought the 5:00pm may be correct. Actually most festivities started at 5:00pm and went on late into the night!. I did see a Lion Dance though at 1:00pm and the various exhibits so I was happy. The Lion Dancers are magic. There are two dancers per Lion and the way they co-ordinate their movement to jump from one table to another and flop down to rest is wonderful to watch. There were two Lions and they also had to co-ordinate with each other and the band. I was mesmerized. Afterwards the Lions sat down and people put money in a red envelope for luck into the Lion's mouth and received a gift from the mouth. I received a large gold hat (lots of money) and small coins over a small gold hat - two gifts! I hope they work. I also had the opportunity of seeing some of the Chinese temples, specifically the Leong San Tong Khoo Kongsi in the old section of town as they provided the venue for quite a few of the exhibits. The roof decorations in Malaysia are very elaborate, much more so than in China. 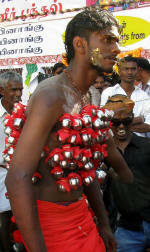 Thaipusam was celebrated from 7 to 9 February. 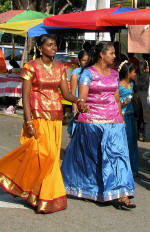 This is a Hindu festival for Muruga. He has 2 wives and is taken by chariot from the home (Mahamariamman Temple) of his second wife to visit his first wife at Arulmigu Sri Thandayuthabani Temple (Waterfall Temple). He returns to his second wife at the end of the festival. Both journeys are undertaken in a silver chariot sometime during the night. The street near the Waterfall Temple is filled with stalls sponsored by various organizations. Each stall has a god, most often Ganesh, unmarried brother of Muruga. I did see some Shiva statues and many that I could not identify. Some provided free food and drink, others charged. Naturally the usual souvenirs were for sale, including Chinese money frogs and other non-Hindu items. 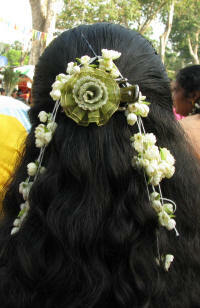 Devotees may shave their heads and have yellow paste spread over their scalps by a priest as a blessing. 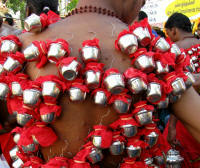 Others carried decorated kavadis (with the help of friends) along the street to the temple or pierced their bodies with hooks holding decorations or ropes. 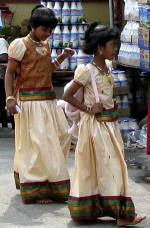 Most wore new outfits and carried the usual offerings of fruit and coconuts. Except for the carriage carrying the god nothing was organized. 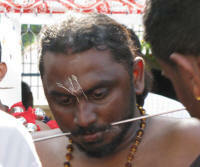 Devotees would come when they were ready and do their thing. Many were there just to look. The music was modern and ear splitting, the one thing I hate, so I did not stay for very long on the 8th but then I had been there on the 7th when preparations were still underway. We had other overlanders (Noel and Aoife from Ireland and Sylvie and Thomas from Switzerland) joined us on the beach for a few days. It was lovely to talk and exchange information. Travelling by car is unusual, most people backpack. Samuel and Phillip (Swiss) and their friends also came along later. We had waved at each other in the Cameron Highlands so it was nice to meet them finally. 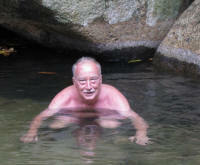 We were told about a lovely fresh water pool where we went and had a marvellous swim and proper bath. The water was cool but refreshing. We had read the Thai visa requirements on the internet but had heard a totally different story from other travellers. Basically the internet said you could get 60 days at the border, travellers said you could only get 15 days at land borders. The Thai Embassy confirmed the information from other travellers and said it would take 1 day. Obviously we wanted a 60 day visa so Monday we set off for the Thai Embassy. We had already been directed there on the Saturday so we knew exactly where to go. Unfortunately the rear drive shaft gave up on the way. We ended up being towed into George Town and had it replaced with one Pieter had brought with him all the way from SA. There was one available in Butterworth so we would still have been able to have the shaft replaced anyway, but it was a bonus to have our own spare. While waiting for the repair we had lunch at a seafood restaurant where, as elsewhere the food is kept alive in tanks until required. The Spider crab definitely looked like something out of science fiction, unfortunately the tank had too much condensation to take a decent photo. By the time the shaft was repaired it was too late to apply for a visa. On Tuesday we applied in the morning and picked it up in the afternoon. The time in between was spent at a shopping mall near Komtar (a landmark building in George Town). I had a promotional massage. This consisted of reflexology, oriental back massage and an ear candle. The masseuse definitely found some sore spots but the ear candle was new to me. A hollow candle is placed in the ear and the back of the ear massaged for 15 minutes. The heat of the candle draws out ear wax, quite a lot in my case. Unfortunately there was no time for Pieter to have it done, I am quite sure they would have brought out a massive amount of wax from his ears as he often had problems with excessive wax. Wednesday we left for Thailand. We expect to return to Malaysia and travel down the east coast of the peninsular. Once again I had to show the staff how to complete the carnet. They definitely want it done but do not have to do it very often so I have to ensure they do it right.